Residents can have their say on the refined vision for the Ward to Downtown Bridge project. Online commenting will be open until November 28, 2018. Residents can provide comments at haveyoursay.guelph.ca and also view project materials including maps and the trail connection and ask questions about the final concept. This second round of engagement follows on the heels of the spring 2018 open house where we presented three bridge concepts. The preferred option was selected by our community and the refined version is what you will be able to view online. An Environmental Assessment (EA) was completed in 2017 which evaluated alternatives for pedestrian bridges crossing the Speed River from St. Patrick’s Ward to downtown. The EA recommended that a bridge immediately south of the Guelph Junction Railway tracks be implemented first to mitigate safety concerns as residents tend to use the railway bridge as a crossing. This project is in the implementation phase of the EA. 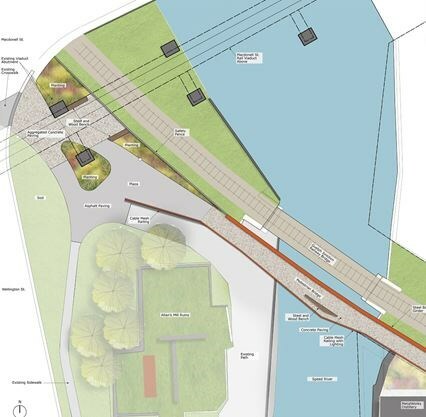 The proposed bridge will link a future trail from Arthur Street over the river to Macdonell Street.